Randi Solin Glass Artist, Randi Solin blown glass, Randi Solin studio glass, Randi Solin hand-blown studio glass. 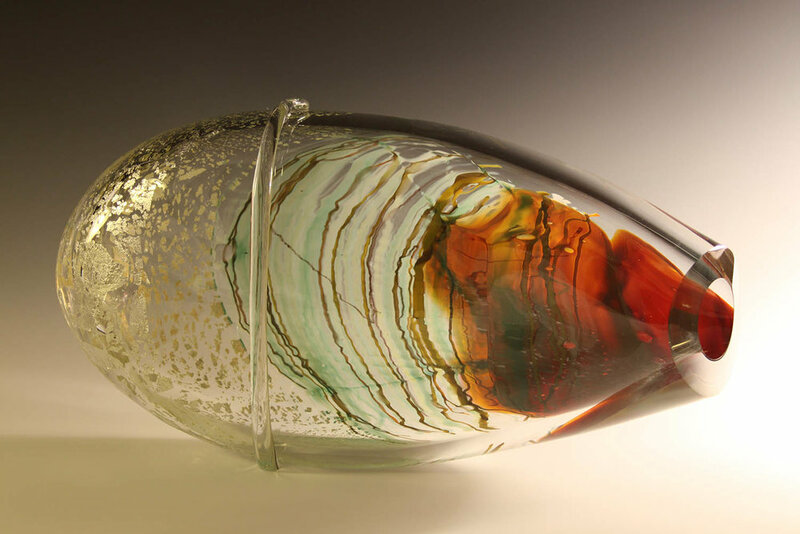 Randi Solin has been devoted to the art of blown glass for over twenty years. Her impeccable technical skills and imaginative coloration style has led to innumerable Best in Show and Best in Class awards and she has pieces in the permanent collections of The White House, The United States Embassies in Algeria and Guinea and several U.S. museums; Randi Solin has been exhibited in museums and gallery shows across the country. Randi Solin approaches her work two-dimensionally, like a painter to a canvas or a weaver using thread to create an intricate tapestry. “My glass pieces are compositions,” Randi Solin states, “and atypical to glass blowing in general, they have a ‘front.’ Generally my forms have an Asian-influenced simplicity, which allows for my complex and painstaking coloration process to unfold. I build layer upon layer of color using glass in all particle sizes - powder, cane, frit, and rod - like a painter’s palette, to create original homogeneous coloration and truly one-of-a-kind work.